I prolly shouldn't be doing this. My mum used to say, 'Robbie [she called me Robbie]. Have the courage of your convictions.' I found out years later that it didn't matter what I thought. All that matters is that you get other people to listen to you and think you're right! Marco Langbroek has delivered another comment, which on the surface would be a very damaging rejoinder to my recent critique of the Campitello Quarry birch-tar hafted lithic implement. I'm crestfallen, since I thought I'd put it very succinctly. My apologies, Marco. Nevertheless, it's apparent that I may not have written it so as to avoid being misunderstood. Apparently he thinks that I've misinterpreted what Mazza et al. have written about the sedimentary context of the find. For that reason [and because I respect Dr. Langbroek for taking the time to provide the contra side in this discussion] I think it's really important that I disabuse my opponent of any false interpretations of the pro side. So, I'm going to begin by quoting the pertinent passages of Mazza et al. 's geomorphological description in their entirety. I'm hoping this'll help to make crystal clear what they (and not just my interpretations of what they) thought were the depositional circumstances of the artifacts and faunal remains. Afterward I'll be in a better position to tackle Marco's rejoinder and clarify what I think most likley explains the presence of the archaeological traces recovered at Campitello Quarry. Nota bene: I want you to keep uppermost in your mind that Mazza et al. are, almost exclusively, describing the generalized stratigraphic succession for the entire Upper Valdarno Basin, and not, directly or otherwise, the actual sedimentary context of the excavation. I'm gonna suggest that Mazza et al. relied either on their own, or a geologist's, stratigraphic correlations across the entire basin, for the inference that the sands they were excavating were the undisturbed sands of the sabble di Levane [see their generalized stratigraphic column below for the location of these named units]. Indeed, one wonders at the absence of what would normally be the obligatory stratigraphic profile of the excavation. I'm left to speculate that there was no such profile to draw, and that the excavation took place after the 15 or so meters of overburden had been removed by quarry workers, leaving only what the excavators interpreted as the undisturbed sands of the upper sabble di Levane. Here is what Mazza et al. have to say [and remember that these are all of what they've published pertaining to the sediments containing the artifacts and animal remains]. Five fluvial cycles were recognized at Campitello quarry. The three lower ... consist of horizontal to planar, cross-stratified, coarse-grained gravel [labelled ciottolami di Laterina in the illustration above]. They are overlain by the trough to plane, cross-laminated and epsilon cross-stratified sand of the two upper cycles [labelled sabble di Lavane in the illustration above]. Individual cycles are some 2-6 m thick and are separated by sharp, generally planar and sometimes erosive bounding surfaces. The fining-upward trend attests to a change from braided and/or lowly sinuous to meandering river deposition. The archaeological and palaeontological items were buried in 0.30-0.40 m of massive, grey-green sand of the uppermost fluvial cycle [i.e. the sabble di Lavane]. The latter consists of 5-6 m tabular, laterally persistent, sand with minor intercalations of silty clay and fine gravel intersects. Lateral accretionary bedding (epsilon cross bedding...) is the dominant sedimentary structure which indicates point-bar deposition in a wide, highly sinuous, meandering fluvial channel [emphasis added here]. ... This cycle grades up into over 15 m of prevalently massive, bioturbated and deeply pedogenized silty clay with abundant root traces, local peaty horizons, and lenticular to tabular sand interbeds [labelled limi di Latereto in the illustration above]. These lithofacies [i.e. the silty clays comprising the limi di Latereto] indicate a flood plain mostly filled with fine-grained overbank sediments and with crevasse splay deposits [emphasis added here]. The stratigraphic indication yielded by [the] few small mammal remains is indirectly confirmed by other six isolated cheek teeth of Arvicola found in thinly laminated silty clay, about 5 m above the elephant bed. Numerous rodent remains were found ... in a layer of fine sand, silty clay and thin laminae of organic debris, that coated the sand bed which contained the stone implements and the elephant skeleton. To summarize, the artifacts and faunal remains were recovered from the upper 30-40 cm portion of the sabble di Levane sands, which were deposited in the time-transgressive context of a point bar. * After the putative deposition of the archaeological traces, the river apparently went on to deposit 30 to 40 cm of additional point-bar sands in the same place, a process that takes considerable energy and is unlikely therefore to result in any depth of finer sediments. Yet, according to the excavators, in that accumulating point-bar deposit they found a 'capping' layer of fine sand, silty clay, and thin layers of organic debris. Given that it was some considerable time before the meandering stream and its point-bar deposit was very gradually replaced by a lower-gradient hydrological regime dominated by over-bank deposits and crevasse splays comprising fine sands, silts and clays. ...it is very clear from the Mazza et al. paper that the laminated fine sands and silty clays (including the microfauna) that cap the artifact-containing deposits represent the place where point-bar deposits change into distal floodplain as the river is changing course and incising deeper. Patination does not exclusively occur when artifacts spend long times on the surface, as you suggest. ... Moreover, ... patinated artifacts are typically older than the Holocene. However much I desire to debate the former of these two points, and call him on the latter statement, I will say only this. I never suggested that the artifacts are, necessarily, Holocene (although I believe that they most probably are). The next, and last paragraph in my reader's comment demonstrates that my original words truly failed to make the sense that I'd hoped they would. So you do not convince me, as your argument does not make sense, taphonomically. In the first place I never said that the archaeological traces were part of a 'hydraulic jumble.' In fact, quite the opposite. I maintain that they never saw the Middle Pleistocene river water that deposited the sands in which they were found. They most likely came together from different layers higher up in the sequence either in one of the erosion gulleys visible in their cross-section, or did so during quarrying. The circumstances that I'm describing would be of the kind I've tried to illustrate in my usual inimitable style [i.e. not very good] in the diagram below. 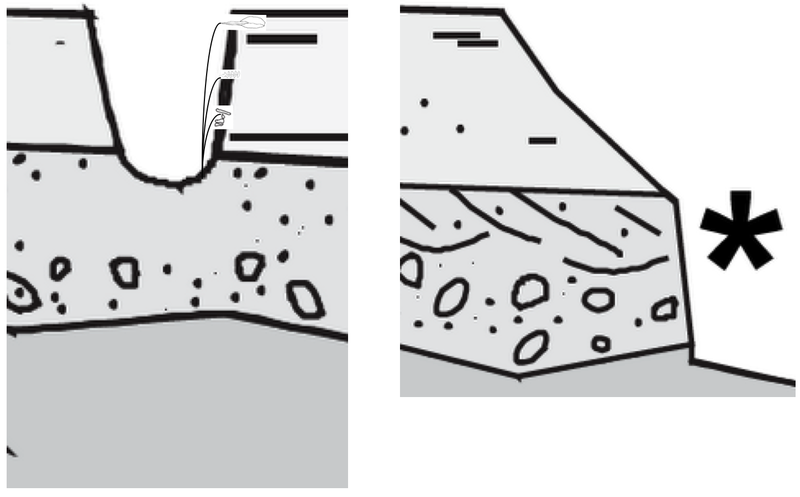 The lefterly part illustrates the erosion and secondary deposition of the materials from different ages dropping into their mixed secondary context. At the top, very near or at the surface is the birch-tarred flake's original locatation. Lower down (approximately 5 m above the archaeological accumulation) is the place where the excavators noticed a primary context for microtine teeth. The archaeological circumstances are equivocal as to the likely temporal relationship between the microtine and the elephant remains. I've depicted the original location of the Elephas bones lowest in the sequence, but there's no reason to think the animal remains couldn't have been penecontemporaneous, or in fact younger than the microtines. It's also possible that Marco is correct, and that the elephant bones are in their primary context. A lot of possibilities. 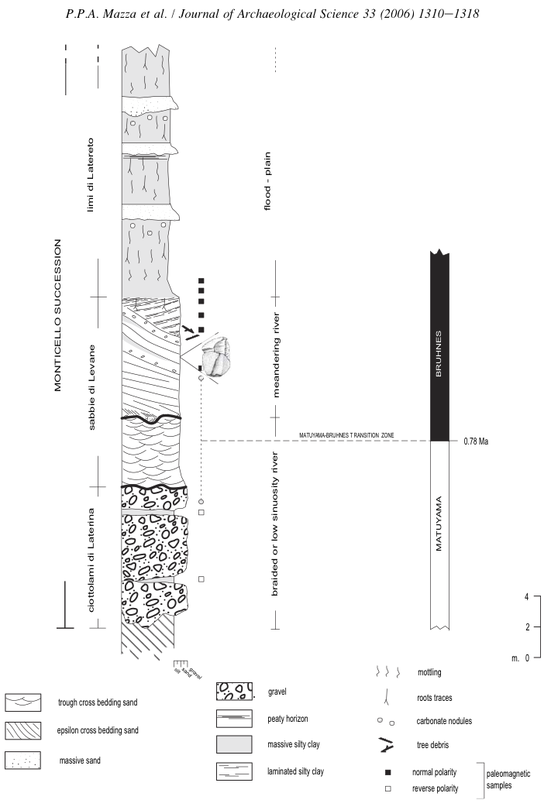 The righterly part of the diagram simply shows the approximate location of the excavated materials in the stratigraphic column, as inferred by Mazza et al. The upper layers, being primarily fines, have formed a cap on the predominantly sand middle layer at the top of which the artifacts were found. Such sediments normally retain a good deal of structural integrity as they erode, leaving a sub-vertical to vertical face that protects the layers beneath it from the worst ravages of erosion. As sure as shootin' an erosion gulley in the Valdarno Basin will incise the upper terrace and when it cuts deep enough to expose the sand, it will allow material from younger sedimentary contexts to drop vertically from the face and be incorporated in the exposed sediments at the bottom of the erosional feature. If the elephant remains were in close association in the intact flood-plain sediments they would, when eroded out, logically form a secondary deposit that resembles, to a degree, the spatial distribution of the primary deposit higher up in the profile. This kind of depositional environment very easily explains both the accumulation of objects of different ages in one place, and makes the circumstances at Campitello Quarry analogous to those at Old Crow Flats. Thus, if I'm correct, whether or not the birch tar was found beneath a mammoth rib is of no relevance whatsoever. It's 'provenience,' regardless of the care taken during its excavation, wouldn't mean bugger all if the sediments were disturbed. Begging the question again!